How to Save Strawberry Runners for Next Year? Q: How to Save Strawberry Runners for Next Year? I will live in NW PA and am moving there this winter. I would like to dig up some strawberrie runners and save them to plant in the new location in the spring. How do I go about bear root storage? Answer to: How to Save Strawberry Runners for Next Year? The easiest way is to dig up the already-rooted runner plants you want to keep, dirt and all, and put them into cheap plastic pots. Keep the plastic pots somewhere where it won’t get too warm or too cold (avoid extreme freezing and keep the plants in their dormant state). Putting them in pots or other suitable containers will allow you to water them through the winter. If their roots dry out, they die. If you do shake off all the dirt from the roots (not recommended), you can store them in sand, peat moss, wood chips, re-cover with dirt, or just about any moisture-holding medium. Re-plant them in the spring as you normally would. 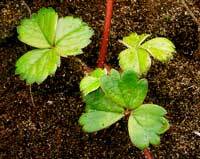 Much more information can be found here: Storing Bare-Root Strawberry Plants. In addition, be sure to check out the additional information on overwintering strawberry plants. Also, if you don’t have a plan for how you intend to deploy your perennial plants, consider the methods discussed on the Transplanting Strawberry Plants page. Good luck! Hi, I have a raised bed approximately 2m long X 1m wide 7 inches deep with soil 6 inches deep. I have grown strawberries for the past two years this year was extremely bountiful. The runners are out and establishing quite well. There are about 20 plants all now with runners, the bed looks as though it could be overcrowded. Each plant has about 6 stems can I prune them back to say 3 stems per plant to make room for the runners, or should I move some plants to another bed. Will it be suitable to use 4 – 6 inches of straw over the winter months. I’ve just bought bare root strawberry plants (Gigantella Maxim) approx 20 in the pack. I live in South Wales UK. I don’t want to plant them now can I freeze then in-till planting next Spring. Or is there another way of keeping them? Thanks in advance. It is not advisable to freeze them. It is best to go ahead and plant them, let them develop roots, and then mulch them over the winter. The success rate is much higher that way. If you absolutely want to try to keep them un-planted over the winter, here’s how. Good luck! I have a greenhouse and I plan on starting strawberries in the spring in a strawberry tower. My question is. We go south for the winter and I was wondering how to save the plants for future planting. Here is how to store bare-root plants. However, in your situation, it will be difficult to make it work all winter due to the monitoring and watering needs. Good luck! I’d recommend starting here. Good luck! We live in Arctic Canada and I would like to keep my strawberry plants until next spring. I think digging them up and bringing them in would be the only way. If not how can I do that? How do I keep them alive but dormant inside? It is difficult to do. The light and the warmth triggers them to leave dormancy. If you can control the humidity and prevent mold/fungus from growing, you can keep them in a refrigerator. You do have to make sure the soil doesn’t dry out, and some may die regardless, but that can at least save a few. The refrigerator should be dedicated to only storing the plants, however, as there will be mold spores of some sort in most refrigerators. Good luck, and let me know if you are successful! Hi! I m from India . We plant strawberry in sept till may . As from May temp raised to 45 degrees . My question is how can I preserve runners in that extreme conditions ( May to August ? You’ll most likely need to keep them in a climate-controlled room to avoid overheating or pathogen contamination. Good luck! If I put down a fabric for weed control, can the runners still set root through them? They will be hampered significantly, although some might root well enough to survive. It is better to poke a hole in the fabric or cut small “X” in it and then place the runner node into it so that the root will be in contact with the soil. That will work much better and allow the runner plant to flourish. Good luck! directly out of a freezer and are frozen together. We thaw them out and plant them right away. We want to save our runners or plants in this way for next season. When would we dig the plants ? and are they really kept all winter in a freezer? You can store them in a freezer, but you will need to control the humidity as well as the temperature. In order to survive, the plants need appropriate temperature AND moisture. Usually, the plants aren’t kept in a freezer all winter by the suppliers, but are kept in the freezer for a time to induce dormancy, and then shipped out as demand requires. To learn more, see this post on overwintering. Good luck! Should I fertilize the new plants I am potting for next year ? Options: Cedar Grove Booster Blend; all purpose 10 10 10;12 special blend 4 4 2 with mineral, bacteria & fungi. The soil is pretty good. (I also have the leachate of vermicompost). 10-10-10 is a good blend for strawberries. See here for more: Growing Strawberries. Good luck! Hi, I planted one of those Topsy Turvy strawberry things and it grew very well long runners but not but a few berries. The runners are still on the pot hung outside but I was just trying to find out if I should just leave them or clip them down so they won’t have to feed all the runners next spring?? I live in Omaha Nebraska and this was my first planting of them this last spring of 2012. I would aprreciate and advice on what to do with them to actually produce berries nex year, Thanks. You might have difficulty producing a good harvest of strawberries with the Topsy Turvy planters. I have written about them here, if you are interested: Topsy Turvy Strawberry Planters. For other reasons why your strawberries aren’t producing strawberries, see here: Runners but no Berries. Also, the runners should have been rooted and separated from the mother plant once the roots for the daughter had established themselves. For more, see the Strawberry Runners and Transplanting Strawberries pages. Good luck! I cut runners off and transplanted them. I know the answer to this question is probably the one I fear, but will the baby plants grow a root system without the attatchment to the parent plant? Unfortunately, no. If you snip the runner prior to the roots developing, the runner plant will die. hi, we are a small ky farm. we are trying to start up a strawberry picking farm. i have around 500 plants that includes original parent plants . this year we have had few strawberries, and many more runners then i thought possiable. i was wondering how do you know how many to grow to sell and save for your own family. if i was to plant let say once acre. and do they need water all year long if we are low in that area. 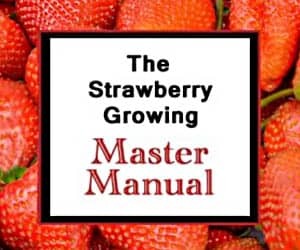 See the Growing Strawberries reference page as it will answer most of your questions. Also, be sure to check the links at the bottom of the page as many more topics are covered there.